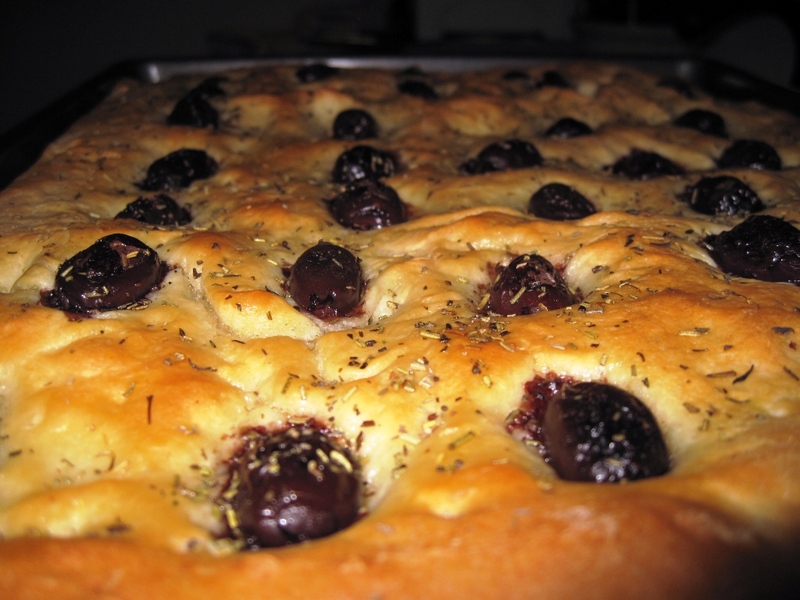 When I began this project five weeks ago, Sarah asked that I include a recipe for bread containing kalamata olives. Now, I’m not sure if she meant bread with olives dispersed throughout, or with olives just sitting on top. So, I went with the latter since I happened upon this tasty-looking recipe. If it turns out she meant the other kind, then I will find one that matches her request. She is my BFF, after all. I found this one in Cook’s Ilustrated’s weighty tome Baking Illustrated. It’s a recipe for Rosemary Focaccia, with adjustments for Parmesan Focaccia, Olive Focaccia, and Sage Focaccia variations. 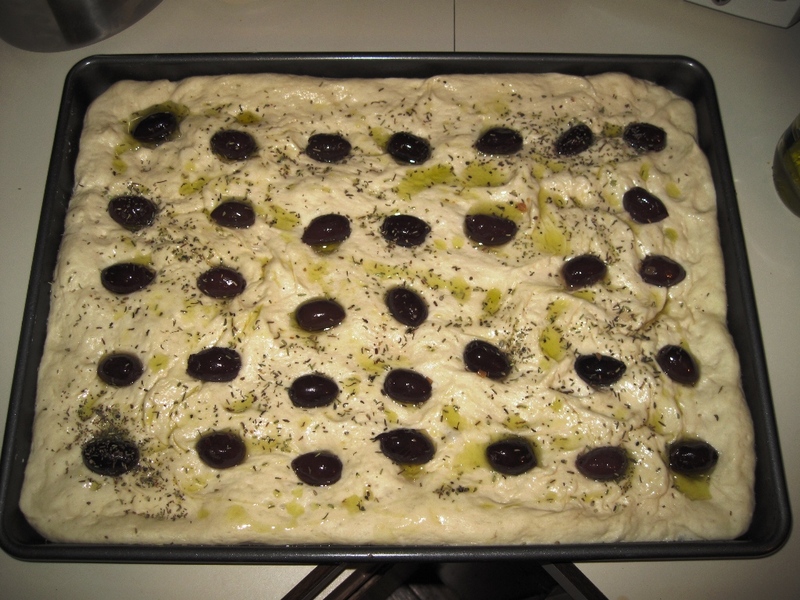 (I’m really getting tired of typing focaccia). I was particularly interested in this one for two reasons: the use of a quick sponge (letting the yeast marinate with flour and water for about 20 minutes), and its use of potato in the dough. I’ve never used either, so I thought it would be fun. It turned out pretty good, with some notable mistakes on my part (see my Results at the end). As always, my comments and adjustments are in blue. Recipe and photos after the jump. Bring 1 quart water to boil in small saucepan; add potato and simmer until tender. Drain and cool. Put through a ricer (or large holes of a box grater). Reserve 1-1/3 cups lightly packed potato. Meanwhile, in large bowl of stand mixer, mix yeast, ½ cup of the flour, and ½ cup of the warm water until combined. 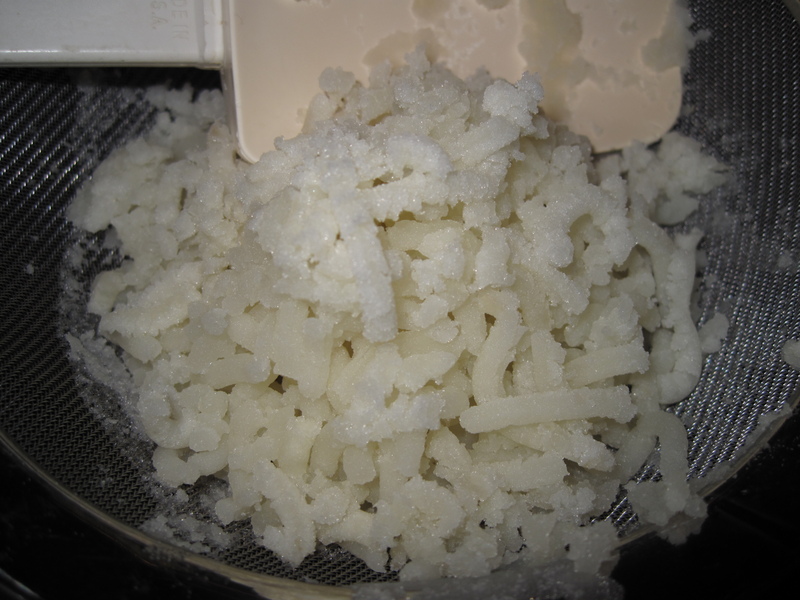 Cover tightly with plastic wrap (or bowl cover) and set aside until bubbly, about 20 minutes. Add remaining dough ingredients, including reserved potato. Mix with paddle attachment on low speed until the dough comes together. Transfer dough to lightly oiled bowl, turn to coat with oil, and cover tightly with plastic wrap. Let rise in warm, draft-free area until dough is puffy and doubled in volume, about 1 hour. With wet hands (to prevent sticking), press the dough out onto a generously oiled 11×15 rimmed baking sheet. If the dough resists going into the corners (which it will), cover with damp towel and allow to rest for 15 minutes before trying to stretch it again. Cover dough with lightly oiled plastic wrap; let rise in a warm draft-free area until dough is puffy and doubled in volume, 45 to 60 minutes. With wet fingers, dimple dough at regular intervals (make about 2 dozen). The dimples should be deep enough to hold small pieces of topping, herbs and/or pools of olive oil. Drizzle the dough with oil and sprinkle evenly with thyme and coarse salt, landing some in pools of oil. Place an olive in each of the dimples. Bake for about 25 minutes or until the bottom is golden brown. Remove from pan and cool slightly on a rack; serve warm. This is the money shot, my friends. A [note] about working with this dough: the moisture from the potatoes helps keep the crumb soft but also makes the dough very sticky. Adding extra flour makes the dough easier to handle, but the results are not as good because the wet dough helps produce bread with air pockets and chewiness. Dammit. Me and my kitchen confidence. Foiled again. Another reason it didn’t bake right: my range is dying a slow death. On Thanksgiving 2010, the back right burner exploded a little bit, causing a teensy fire that created a short in the range’s electrical system. So, that burner’s been out since then, and the left front burner died a couple weeks ago. And now the oven is going through its death throes: temperature on the dial is about 50-100° off from the internal temp, and even when I think I’ve got it set, the oven won’t maintain a consistent temperature (it’s like a sine wave of temperature fluctuation in there, with a standard deviation of about 50°). So, not an ideal situation for baking, to say the very least. The focaccia thus did not bake the way it should have. I just remembered I forgot to sprinkle the top of the bread with salt. No wonder it didn’t taste seasoned enough. Man, I gotta start paying more attention. I just get so wrapped up in baking, I sometimes forget stuff. So, don’t forget the salt on yours, okay? Is it weird that my internal Kitchen OCD Alarm went off when there wasn’t a perfectly formed grid of olives? The only reason I didn’t make it a perfect grid was that I ran out of olives. And using green olives would just have made the whole thing worse, really. I’m also ticked off that I accidentally deleted the photo I took of the dough as it was done kneading. It’s not critical, but I’m annoyed with myself. I hope you forgive my carelessness. Again, I’d like to mention that you can find a printable version of this recipe by clicking here. If you decide to make it yourself, please let me know what you think of the recipe and any thoughts you have about improving it. Warning: the first person who suggests reading the recipe first is gonna get slapped. Oh yum!!! Olives? I’m in. I promise that I will forward my Mom’s Irish Soda Bread recipe to you shortly…. I am not a bread baker, but L O V E to eat it! This looks YUMMY!! !